Saw the blog about the affect on NGS grade from playing with New players. It strikes me that it is ok to tell everyone that "the EBU has not seen any evidence that playing with weaker partners is bad for a member’s NGS grade". However, some people would like to have some sort of evidence of this. So couldn't someone prepare an event calculation to show how, say three pro-am pairs, finish after playing against a "normal" field of say 8 or 9 tables on a normal club night. Just a thought as I would like to see students encouraged to play. I suppose the only problem might be that some might find it hopeless because their "partner" had no idea of the "latest" gadgets that they love and frequently get wrong! Martin, John and Douglas please feel free to treat this thread as rhetorical!! SGa = Ga + gain*(p –50 + SOpp –½ Ga –½ Gb) and substituting the par difference for "(p –50 + SOpp –½ Ga –½ Gb)" I obtained a figure of 0.1153846154 as the gain shown above. So either my calculations are duff (possible) or my reading of the calculations is duff(again possible) or the description of the calculations is lacking. So waht is the "gain" and how does one calculate it? I feel that anything like this needs to be clear. Anyone else found difficulties doing the sums? Or do you have an idea where I have gone wrong? I will continue to look but any help would be appreciated. You might be seeing a discrepancy because SOpp (strength of opposition) is not quite the same as SOF (strength of field). SOF includes your pair, which SOpp doesn't, and they will differ more in a two-winner movement or a Swiss event. It's really incredibly uniform all the way up, and actually leans a tiny amount in the other direction (it helps your grade to play with a much stronger/weaker partner). John I can agere your comment about more than one novice and any resulting effect. You always get to the nub of the point and leave others way behind. Michael I think there is a bit of a gap between your understanding of "uniform" to mine. Uniform = "remaining the same in all cases and at all times". I would just add that it isn't that I don't agree the statement that playing with a novice can help your NGS but that a lot of people need to see the proof or at least be able to work out what they are being told is close enough. On my EBU NGS stats page I don't get told the SOF and anyway the NGS guide only includes calculations about the SOpp and nothing about the SOF (see version 16 pages 11 & 12 of the guide). So from what you say are you telling us that the calculations included in the guide are not the ones used by the computer at 4.30am? It might also help if we are also given the "gain" factor and the "weighting" factor. By the way looking at your pictorial graph now gives me more doubts about statement that "the EBU hasn't seen any evidence that playing with weaker partners is bad for a member’s NGS grade". So to my original post it must be easy to have results to demonstrate how the NGS is effected and give the full calculations. Maybe even have two or three pro/am pairs to see what can happen. Maybe "symmetric" was a better word. I just meant there's the same amount of stuff on the left of the graph (where your grade goes down) as on the right (where your grade goes up). If there was a disadvantage to playing with a weak player, you would see a lot more dots on the top left side, but actually there are very slightly more in the top right. It does use SOpp, not SOF. You said you calculated this from the BridgeWebs page, so I was just suggesting why that might not be exactly the same. For a club session, gain will be 2 and weighting 1. "Maybe even have two or three pro/am pairs to see what can happen." Sorry Michael I am not sure if I understand the axis of your graph. If it is "symentric" then doesn't that imply that there is a chance that the grade will go down at the same rate that the grade will go up. Roughly a 50% chance? I am also uncertain as to how your figures have been brought together. I assume that the "grade difference" is in percentage points but I don't quite understand where the "performance" figure comes from. Is it the equivalent of the "par" figure shown on MyEBU for the strong player or the weak player? Or is it a mix of the two "adjustments". If it is a mix then isn't it possible that the stronger player will be more to the left of the graph than the student? I know that your graph shows "thousands" but we really need to know "thousands of what"? My final paragraph of my last posting does refer back to my original post. "Grade Difference" is the difference between the grades. As in the stronger player's grade minus the weaker player's grade. "Performance" is how well you did in the session. A plus score means the pair performed better than expected (and so their grade would have gone up), and a minus score means they did worse. It's the same as par. And yes - there's a 50% chance of the grade going down and a 50% chance of it going up. Which is exactly what it should be if the initial grades are accurate. So as I understand it the graph that you have shown includes all partnerships (whether long term or short term) over a long period of time. The only problem is that the very inexperienced player playing with a stronger player isn't shown separately. 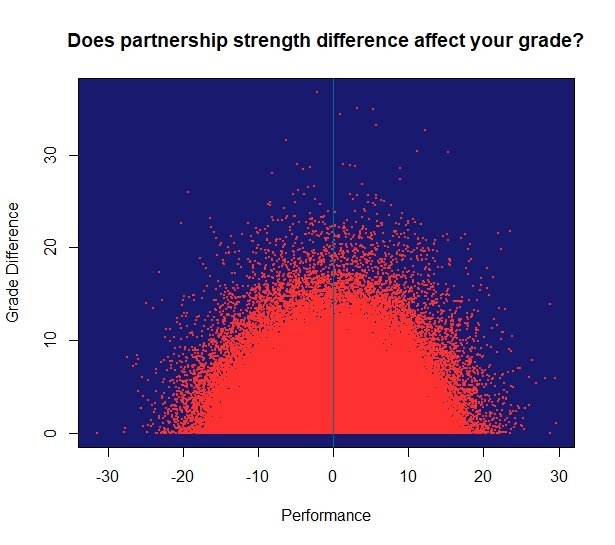 Therefore the graph may be "skewed" and partnerships with the inexperienced may be more to the left and partnerships with those of more experience of bridge are to the right. I also assume that it doesn't show the result of the inexperienced players first 150 boards (or perhaps it does). I think that as John said above the very inexperienced player can be somewhat of a "loose cannon" when playing in an experienced field. I think someone has also mentioned (comments on the blog) that maybe the 150 boards is insufficient, I agree. I also agree with John that in a way the only really proof that playing with a novice is not detrimental to the strong players NGS, can only be demonstrated by building individual results over a period of time. In addition I also believe that many inexperienced players need to be led in to play with the stronger players. Their knowledge base isn't good enough to play at too high a standard until they have played a substantial number of boards. It is all about confidence and putting too much pressure on the inexperienced player is both a waste of time and potentially throwing away all the hard work of teaching the students. We would all like to see the students move from the teaching sessions and do well playing on the club scene as soon as possible. Most teachers know that that is likely to happen in at most 2 or 3% of cases. Access to further content in the site is available for clubs who are taking part in the campaign. Did you see that the EBU club Development site is a topic at this years conference, do you think unaccompanied teachers will be allowed in????????????? Only if they take their club committee with them. One thought that comes to my mind is that I am not sure that I would wish to go to the effort and expense to go to the meeting if that would appear to be all we are talking about. The "flyer" isn't that clear about how much we are discussing on each subject. If I and my partner go it is a substantial sum to find and I suspect a number of other teachers will be affected in the same way. And there again what do all the other teachers that don't/can't go, think about it? "Novice team from Lincolnshire wins Harrogate Congress Swiss Teams" - I thought well done to them. I am fairly sure that this thread is not about this grade of Novice, but perhaps this is how the EBU few novices! Yep I noticed that. Perhaps their NGS is only just "emerging" and they have been brought on by mentors who were AH and they have also been able to progress to AS. Unfortunately it does not cast a good light on how the EBU views the general bridge playing members. But there again John we are lucky as we are still able to see the joy displayed by real novices when they bid and make their first slam. I have been talking to two other teachers, we had all played in a County event and were drowning our sorrows, and have come to the conclusion that teaching a system that we don't actually play is detrimental to our own standard of bidding and play. Nobody ever seems to take that into account. It seems that teachers, on their commencement, are not informed of this possible "drop" in their "standard" and no one is prepared to allow for this. Somehow, the "powers" that be need to be aware and need to look to make life "pleasant" for the teachers of this thrust to keep the game alive. Perhaps the EBU needs to look at how the National level and the County level looks more to the teachers to provide for the lower levels of the game rather than setting the strategy for the better players. It seems that we spend too much time organising and praising the Tollemarch/pachabo/Nicko side of things but why can't there be more for the general membership, after all they would appear to contribute most and get least out of the EBU? I was never taught bridge in class but rather by playing with 3 others who took me through the basics. 30 years later I started to teach and my bridge improved no end as I finally really understood some of the basics and extensions. The teaching also led me to the wider aspects of the game and the EBU which again opened up my bridge horizons. The students also keep me on my toes and expand my reasoning and understanding. It is true however that my NGS grading has dropped since starting teaching although my enjoyment of the game has increased and the drop may partly to do with partner change , age and senility. A bit unkind, John, but pretty accurate! You can look at the world of bridge as a pyramid with the more competitive players at the top (if you wish!). The reality is that the number of players at the top of that pyramid is decreasing (see EBU competitions numbers) and the number in the rest of the pyramid may actually be increasing if we look at the number learning in various places. You're right that that leads to a need for attitude/cultural change at the EBU and in the counties and I'm seeing quite a lot of evidence of this. It's one thing changing attitude/culture though and quite another thing to acquire and implement the skills needed to take advantage of that change. The EBU and counties have traditionally and historically thrived by catering for competitive bridge. We're now seeing, for example, quite a lot of cafe bridge being organised by clubs/counties. That suggests to me that we're moving in the right direction - it would just be nice to arrive more quickly! Oh, by the way, I think, but have little evidence to support, that NGS is reasonably fair and accurate. I've been playing poorly for a few months, with no change in type of partner, and my NGS, which has been steady for a few years, has gone down a couple of points. That seems to me a reasonable reflection, even if not exactly accurate. Interesting discussion! Just to add that in fact not only is the blog completely public, but also anyone can comment on a blog post (subject to moderation).